(NaturalNews) To hear her tell it, Big Pharma is in the regulatory crosshairs of Democratic presidential nominee Hillary Clinton. She says she's had enough of their 'price-gouging' ways, and plans to 'reign in' their consumer-harming policies. If you believe that, there's a bridge in the middle of nowhere to buy. The fact is, neither is Clinton going to "reign in" drug companies, nor is there a widespread problem with "price-gouging," as she claims. The truth lies somewhere in-between, but make no mistake about it: A President Hillary Clinton isn't about to attack a major benefactor. The fact is, as noted in a newly released white paper by Natural News' partner site, News Target, which covers politics, technology and other subjects not dealt with here, Clinton is wholly owned and in the pocket of Big Pharma. In fact, the paper points out, she is the presidential candidate who has received the most in donations from pharmaceutical companies during the current election cycle. Nevertheless, she is still pretending that she's the answer to skyrocketing drug prices and price-gouging by pharmaceutical firms, having laid out a 'major plan' to combat both issues if she wins in November. What's more, the plan she laid out is telling in terms of what kind of president she would be: Like Obama, another Democrat, her approach to policy is the adoption of punitive, harsh regulatory measures that punish industries rather than implementing policies that empower industries to find their own free-market solutions which also benefit consumers. As reported by Zero Hedge, Clinton's "fairness doctrine" for Big Pharma involves an "aggressive new set of enforcement tools," including the levying of fines and imposition of stiff penalties on drug makers when some government bureaucrat self-determines that there has been an "unjustified, outlier price increase." This is akin to government-imposed price controls, which is precisely what is going on down in Venezuela, where the people are now so poor, deprived and fed up with similar policies adopted by their government, they they just chased their president out of town, fearing for his life. "Over the past year, we've seen far too many examples of drug companies raising prices excessively for long-standing, life-saving treatments with little or no new innovation or R&D," Clinton said in a statement. In the past, lawmakers have refused to go along with government price controls on much of anything, but especially on drug companies. Most in office now are aware of one government-imposed pressure on the health industry in general – Obamacare – that is causing prices to spiral upward, for services, for insurance premiums and for drugs. In fact, nothing President Obama and fellow Democrats promised the law would accomplish – lower out-of-pocket costs, improve access to care and overall coverage – has come true. Drug makers themselves have argued that government-imposed price controls are also impediments to research and development. But never fear; Clinton and her big government cadre know best. "Our pharmaceutical and biotech industries are an incredible source of American innovation and revolutionary treatments for debilitating diseases," said Clinton. "But I'm ready to hold drug companies accountable when they try to put profits ahead of patients, instead of back into research and innovation." 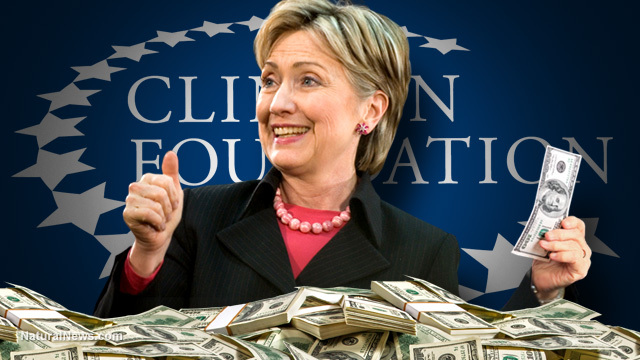 Clinton – whose only "business" enterprise is her family's foundation which, as noted in the News Target white paper, was used constantly as a "pay-for-play" enterprise – has never opened, owned or operated a business. So she obviously doesn't understand that profits are not simply used for "research and innovation," but also for expansion and growth, which then leads to more jobs and opportunities for people. Also, as the Manhattan Institute notes, government-imposed price controls actually harm patients, so Clinton is wrong on both counts. But the fact is, her "plan" is bogus anyway, because she has no intention of biting the Big Pharma hand that helps feed her, her campaign and her family's foundation.